Welcome to my website. I’m Carola Beekman, I am married, we have a daughter and live in Arnhem, The Netherlands. I would like to teach horses and people a way of training that really helps both horses and people to develop. I began riding at a young age and I have ridden in many competitions, especially in dressage. In 2003 I stopped riding in competition. I saw so much stress, anger and misunderstandig between horses and their riders that I no longer wanted to be a part of that world. During that time, I also had Freestyle lessons (by Emiel Voest ) and training in TTeam (by Linda Tellington – Jones). These two worlds were so far apart, that I decided to look for “something ” in the middle and in 2005 I found Straightness Training, developed by Marijke de Jong. On the left Macho in 1997: short upperneck, long underneck, all his weight on the frontlegs, stiff and straight hindlegs. On the right Macho in 2012: longer upperneck an shorter underneck, his weight much more on his bending hindlegs. 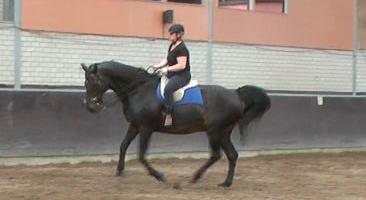 I found a way of riding that taught me how to systematically develop my horse and myself as a rider. Macho had many physical and emotional problems caused by castration performed incorrectly and also because of his build. Soon he began to develop, he became physically stronger and more supple. In 2011, I decided to follow the Straightness Training instructor program. Straightness Training has brought us so much. I wanted to teach others. So there could be many more horses and their riders helped. In training to become an instructor it became clear that emotional, mental and spiritual problems stood in the way of our development. Macho has an introverted nature, and with my previous ‘telling style’ of leadership, there was no pleasure in our work together. I was too focused on results and had to learn to focus on the process and to establish cooperation that was pleasing for both my horse and myself. It was a rough period, but above all very valuable. Our connection is greatly enhanced and Macho has grown a lot, in terms of self-confidence and pride. He now dares to express himself and has fun working with me. I was also faced with further challenges as Macho had fears connected with travelling in the horse trailer. The loading and traveling gave him too much stress. In my search I came across the video tutorial trailer loading course by Eddy Modde. And after five practice sessions we managed again to load and to travel without stress. Macho’s problem had to do with a combination of emotional, mental and physical imbalance. Exactly where we also work on with Straightness Training: balance in the broadest sense. In 2012 we graduated and I became a 3rd grade ST instructor. Furthermore, I specialized myself in trailer loading training. During my training, I have already taught a number of people and trained several horses. Now I have the opportunity to help develop more and more horses and their riders. Besides my work as a Straightness Training instructor. I work as a children’s coach and coach teachers. I’ve been working in education since 1996, first as a teacher. In 2006 started working as an intern supervisor in which I graduated in 2008. In 2011 I graduated as a headmaster. I have also done many courses in coaching of adults and guiding children with special education needs. In 2013 I started with the training of ‘Image Coach’, where I learned to coach teachers through video images. I have also translated this into a method that I can use in guiding horse and rider. Straightness Training is dynamic, it continues to develop, because there are still horses offering us puzzles. Looking for the solution, Straightness Training is continuously refining and developing its method. I will continue to study the masters of the past and present to deepen and broaden my knowledge. Are you interested in organizing a clinic in your area or participate in one? Please contact me!